Global warming leads to endosymbiotic archaeal growth and generation of organelle called the archaeaons. The archaeaons secreting RNA viroids are called the viroidelle. The RNA viroids exist as a quasi-species consortia which can generated new RNA viroidal codes by itself mediated by archaeal digoxin induced RNA editing. 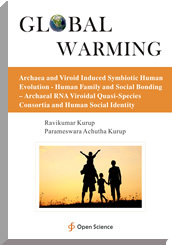 The archaeal RNA viroidal quasi-species consortia gives identity to the family and society and contributes to the signature of the group. This is the basis of bonding behaviour in the family, caste, community and group.